ShowUser – Indicates whether to display the user’s name along side its response. Default value is True. AllowMultiResponses – Indicates whether an user can post multiple response for a Survey. Default value is False. AllowMultiResponses TRUE to allow multiple responses to the survey. Description A string that contains the description for the list. Direction A string that contains LTR if the reading order is left-to-right, RTL if it is right-to-left, or None. EnableAssignedToEmail TRUE to enable assigned-to e-mail for the issues list. EnableAttachments TRUE to enable attachments to items in the list. Does not apply to document libraries. EnableModeration TRUE to enable Content Approval for the list. EnableVersioning TRUE to enable versioning for the list. Hidden TRUE to hide the list so that it does not appear on the Documents and Lists page, Quick Launch bar, Modify Site Content page, or Add Column page as an option for lookup fields. MultipleDataList TRUE to specify that the list in a Meeting Workspace site contains data for multiple meeting instances within the site. Ordered TRUE to specify that the option to allow users to reorder items in the list is available on the Edit View page for the list. ShowUser TRUE to specify that names of users are shown in the results of the survey. Title A string that contains the title of the list. As you can see the two exclusive properties of the List Survey, ShowUser & AllowMultiResponses are present here which is exactly what we need. The other properties can also be updated using the CSOM so I won’t be using them here. One important thing, this method simultaneously, also creates, updates, & deletes Fields/SiteColumns for the given List. However, if you don’t want to use them (as will be the case here) you can pass an empty string as parameters. Following is the code sample to accomplish this task. The first part demonstrates how to construct the parameter, listProperties. Finally, we’re going to use this parameter in the UpdateList method. The following code is a sample demonstration to call this method from the Lists.asmx service. Note that since this service is dependant on the site’s url, it will always vary from site to site. Hence we’re setting the url of the web service at runtime. One more thing, all the parameters that will be passed should be string i.e., the OuterXml property for XmlNode parameters. 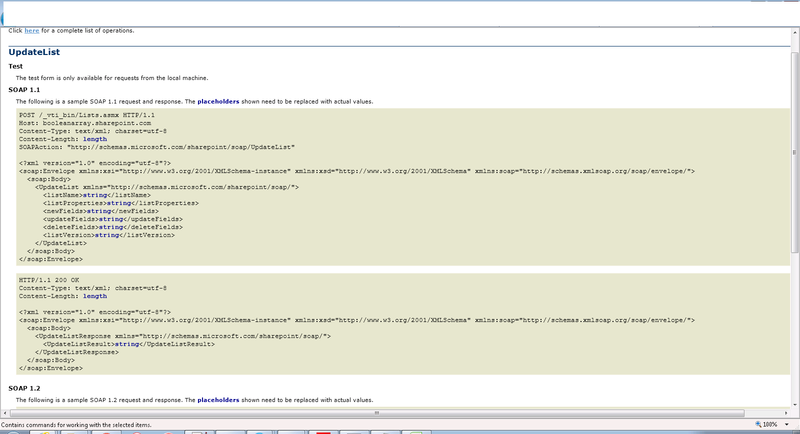 I have already written a blog specifying how to create a List for SharePoint using Client Object Model. You can check that here.Though that code worked for most of the Lists, the List, Promoted Links, Report Library, and Asset Library, could not be created. They were constantly throwing the error, Invalid list template! As far as I was concerned, ListTemplates that were passed to the ListCreationInformation were correct. So why this error?? Here, I must also mention that I was trying to create these Lists on the Web template Team-Site. The problem was I was only passing the baseTemplate to it. However, for these Lists, I needed to mention the GUID of the Feature, that contained the schema of the new List. Following is the modified code. // that contains the list schema for the new list. SharePoint has many Lists. Following is a list of BaseTemplateType of some of the SharePoint List that I know for a quick reference. Again it’s not a complete list, it’s just a list of all the SharePoint List BaseTemplateType that I am aware of. I might have to further modify it in the future. 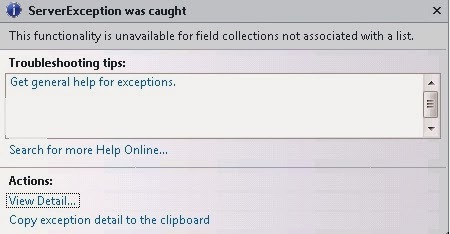 SharePoint Client Object Model Error: This functionality is unavailable for field collections not associated with a list. I got this error while trying to create a SharePoint ContentType using the Client Object Model. The problem occurred when I tried to add an existing field to the new Content Type using the contentType.Fields.Add method. However, we can only add existing Fields only to a List in this manner. For a ContentType, we have to use the contentType.FieldLinks.Add method. The below commented line was throwing the error. I then replaced the Field with FieldLinks and then, my custom ContentType (Piyush_ContentType)was created with all the SiteColumns of the Parent Content Type (Task) plus one custom SiteColumn, Birthday (Date and Time). Remember, to mention the contentType.Update(true/false) at the end to map your changes to the server.